Yes--we will miss our families terribly. We already do, and we are so sad we cannot celebrate this holiday around a big, candle-lit table with them. Plus, my parents and in-laws both make the most delicious Turkey Day fare. And I will miss it. I've never had the chance to cook a Thanksgiving meal. Someone up the Turkey Day hierarchy has always taken on the big task. 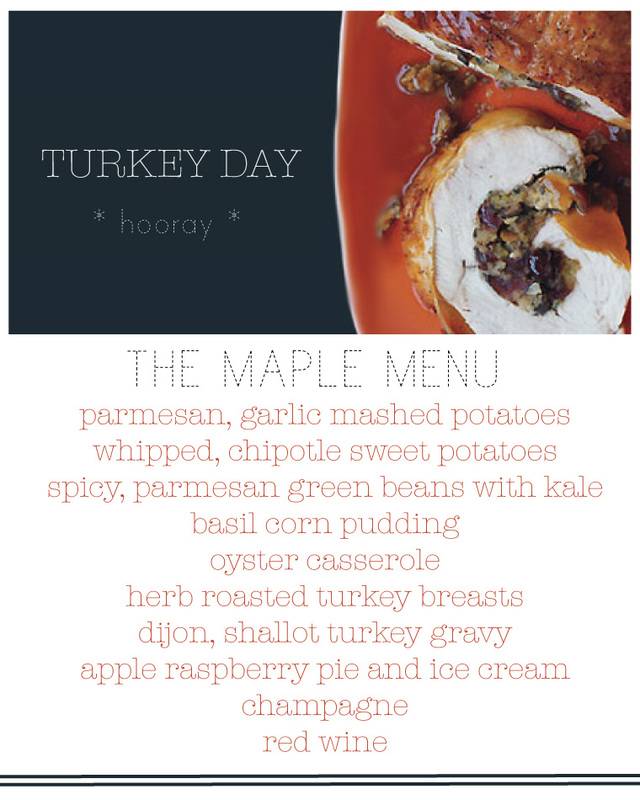 So Corey and I planned the above menu around our favorite dishes (some with a twist)--and sides we really love to cook. It will certainly be a feast, and one we're going to share with our neighbor who can't make it home either. It will be amazing, and delicious, and so much fun. I'm thankful for the most wonderful husband, friends and family, and all that I'm blessed with. Because really--I am beyond blessed. And I'm thankful for the love that I have for cooking, and for this holiday that lets me savor my day-long labor of love. mmmm it all sounds so good! Especially the sweet potatoes and the dessert! My husband and I are thinking about traveling for Charselton in January. Do you know of any good bed and breakfast's that centrally located? Also, what's the weather usually like in Jan?